If one ice lotus couldn’t stop her, how about more? Yun Xi didn’t choose to seal Hua Huo in the huge ice mountain, like what he did in the battle on the Island of Mist, because the same trick was useless against her. If he used it again, it wouldn’t be possible to seal her again as before. If anyone fought with Hua Huo, that person should never let his guard down or push his luck. Yun Xi knew Hua Huo better than anyone, so he treasured her very much. The second, the third, the fourth ice lotus appeared in the swing path of Hua Huo’s sword. Since his “quality” was inferior to Hua Huo, then he would win her on “quantity”. This was Hydra’s world, as the White Emperor, Yun Xi could gain countless powers from the sky and the earth. Perhaps this was his only advantage when facing Hua Huo. Yun Xi also learned Yun Que’s battle style after getting along with him for a long time. Although he didn’t agree with Yun Que’s view of “for victory I can be unscrupulous”, Yun Xi learned his style of exerting advantages. Yun Xi couldn’t find any weaknesses in Hua Huo with his eyes. No matter whether it was her attack, defence or speed, they were all perfect, even amongst all the hero ranked beings. It was hard to believe that she hadn’t entered the hero rank yet, and her strength wasn’t something possible to be obtained by humans. Yun Xi got touched with the Dragon God’s Apostle, the White Holy Dragon’s real body, he also saw the hidden fantasy creature in the Water God’s world, the Mist Demon tree. On top of this, his body even carried the real power from Hydra, which was a genuine legend ranked power. Even so, Yun Xi still felt that Hua Huo’s Bloodline power was so terrible that he couldn’t even judge her limits, as if it was a power that never belonged in the mortal world. Hua Huo had only released a tiny part of her Bloodline power, and she was already able to kill a hero ranked male fiery dragon instantly, and she didn’t even fear fighting against Yun Xi’s Mist Soul Army of one million. What was hiding inside of Hua Huo’s body, where did she come from? She was so strong, it was hard to believe that her parents in the small village were her real parents. After knowing how strong Hua Huo was, Yun Xi was curious about her secrets. He wanted to know everything about her. However, the most urgent matter at this moment, was to survive her attacks. “Ding!” After smashing seven ice lotus’ Yun Xi had created in the air, Hua Huo’s sword finally stopped. At this moment, she was still ten meters away from Yun Xi, staring at him with anger and reluctance. “Dancing!” Hua Huo held the broken sword in her hands and brandished it toward Yun Xi. This time, the sword wasn’t fast and didn’t look powerful, but Yun Xi felt a sense of suffocating danger. “Ding!” In a hurry, Yun Xi created two ice lotus and tried to block her attack with them. The trace of her sword suddenly changed, brandishing toward him from a different direction. Hua Huo’s sword, the movement of her body all pointed out that her attack would come from the right side of Yun Xi’s body. But in an instant, which was probably even shorter than a centisecond, she cancelled her movement and moved to another direction instantly. If he hadn’t saw her secret, he wouldn’t have been surprised, but in this world, apart from Casina, he was the only person who could see Hua Huo’s movements clearly. Therefore, when he found that she had cancelled her movement and shifted her position in an instant, he was really shocked. By extracting energy from the sky and the earth, Yun Xi created four ice lotuses in the air again, and this was already his limit. The energy in this world was infinite, but the bearing capacity of his body had a limit. The maximum number of ice lotus he could control was nine, and every time an ice lotus was smashed, his body would also be harmed due to the link between himself and the ice lotus. Hua Huo’s Sky Flying Sword wasn’t something that was easily dealt with. “Ding!” Hua Huo moved and brandished her sword again, which totally conflicted with Yun Xi’s common sense. She smashed three ice lotuses at a lightning speed. Then, she used her special skill again, moving close to Yun Xi, only five metres away from him now. Five metres, to a super swordsman like Hua Huo, it was a deadly attacking range. Feeling the burning blood lights, Yun Xi even sensed death itself. “Da!” The fourth attack. Yun Xi’s final defence was also broke. The sword had fiercely scratched his face. No, this distance is too dangerous! They looked at each other and understood each other’s thoughts through their eyes. Yun Xi controlled the nine ribbons to form a crimson shield in the front of himself. Its defence power was stronger than the ice lotus, but it also meant that Yun Xi had been forced into the corner. “Even if you are the star in the sky, I will draw you down to the earth!” Hua Huo pressed forward with indomitable will. 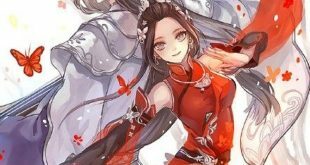 “Yes, this is the will of the Rigid Body, the power that can smash everything blocking the way.” Casina looked at Hua Huo forcing Yun Xi into the corner with an appreciation. Her burning battle will was the proof of her Rigid Body. It was never a good choice to fight recklessly against the Rigid Body. In this case, what will you do? Haven’t you realized your strategic mistake? “Boom!” The strongest shield formed by the nine ribbons was broken by Hua Huo’s sword. It was still an attack that violated the rules of the world. As if the times Hua Huo’s sword drew back, charged and moved had all been cut off from the time of this world, there was no trace about those movements. Is this her godlike sword skill? Where did these times go? Why couldn’t I feel their disappearances? Blood flew into the air, a deep wound appeared on Yun Xi’s face. He finally failed to dodge her sixth attack.